During the first days of the Minsk 2 ceasefire deal, Ukrainian forces lost some 70% of the recently regained territory east of Mariupol. However, these losses were not that dramatic as Russian forces occupied the land over the previous 5 months at that time and forces of Regiment Azov managed to hold some of the soil to establish a new line of defense east of the coastal hub of Mariupol. Ukraine also lost the city of Debaltseve plus dozens of surrounding towns and villages after the 2nd Minsk document was signed – enough reason to nullify the entire fake treaty by the way. But all this happened during the first week of the signed “ceasefire and peace deal”, when emotions and battlefield actions still ran high. Also the strategic value of all losses during that week were manageable, given the fact that Debaltseve was mostly encircled at this time anyway and the focus in the south lies on Mariupol and not villages like Pavlopil or Kominternove. At the same time, the events that took place during the last 5 days around the strategically important north eastern frontline town of Stanytsia Luhanska must be called “dramatic” and are mostly comparable to what happened during the Minsk 1 “ceasefire” deal around the new terminal of Donetsk airport. Russian forces used the time to close in on the terminal, occupying places just 50 meters away and laid ground for their offensive in January, which finally reached its goal to entirely take the strategic and symbolic airport. 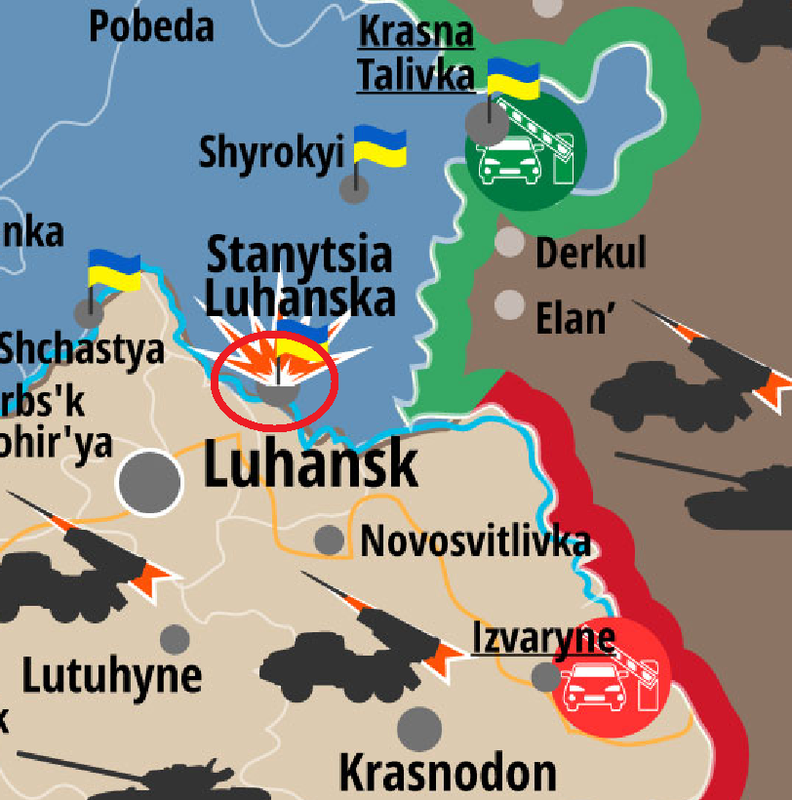 Where is Stanytsia Luhanska located and why is it so important? Stanytsia Luhanska is a former 12.000 inhabitants town which is located almost on the North Eastern very end of the Ukrainian-Russian front in the Donbas region. It’s fall would not only mean another settlement falling under Russian control, but the emergence of a strong Russian bridgehead beyond the Minsk 2 demarcation line river “Seversky Donets” and an extension of the direct Russian-Russian-occupied border inside Ukraine and thus the possibility for Russian troops to bring more reinforcements directly from Russia to the front inside Ukraine and push more effectively towards northern Luhansk region. Until now, the town and its surrounding villages were in the comfortable situation of being located just north of the frontline-river Seversky Donets, which as a natural barrier stopped the Russian advance back in August 2014 and was – also therefore – so far defended with all necessary means by the Ukrainian army and its volunteer allies. This changed after the Minsk 2 agreement. Ukrainian leaders – once again – were shortsighted and naive enough to pull back their forces from the river, relying on the Russian adherence to the Minsk agreement. Admittedly: Crossing bridges over a RIVER, defined as a common border, is the most flagrant and visible violation of a peace treaty imaginable and there can be some confidence, no halfway reliable partner – even enemy – would violate an agreement in such blatant way, if he wants to be taken by his word in ANY future negotiations. However, the Ukrainian side once again seems to have forgotten who we are talking about, namely the Russian expansionist regime under its ruthless leadership. Not even 5 weeks after signing the Minsk 2 treaty, the Russian invasion command in Moscow decided to ignore the agreed on demarcation line and cross the Seversky Donets river at two points, not just to control strategically important bridgeheads for now, but also to have a springboard for their – surely already planned – attack on the town and wider northern Luhansk region in the coming months. As a logic consequence (of their “not-before-Kiev” satisfied territorial aspirations in neighboring Ukraine), Russian forces crossed the – unguarded – railway bridge west of Stanytsia Luhanska on March 16, establishing a well-fortified bridgehead on the eastern riverside, some 1100 meters from the town itself. Ukrainian forces realized the crossing of the river, but were – “in accordance with the Minsk agreement” – not allowed to attack the Russian corps and re-establish the agreed-on Minsk demarcation line. Instead, they “went to the militants and asked them to return to their side of the river”, which must be described as beyond naivete. While the talks attempt and the threat to recapture the area by force was first announced by the governor of Luhansk region, these aspects were later removed from the official news release, likely b/c the leadership in Kiev ordered a total silence and no reaction on the events. No military response – not even an official complaint to the signers of the Minsk 2 deal or the OSCE – happened and the newly established line of contact on the wrong side of the river was simply pretended to never have happened in Ukrainian policy and media announcements since then. Three days later on March 19, news of a battle at another bridge, south of Stanytsia Luhanska emerged, with the official statement saying the bridge was “completely destroyed” by a large explosion, indicating this explosion was triggered to prevent the repetition of the March 16 events (described above), some kilometers to the north west. 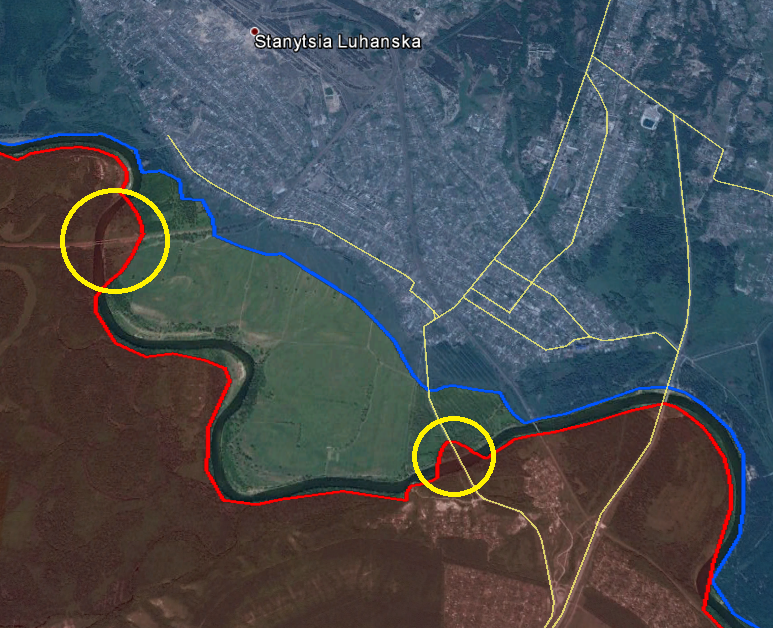 However on the next day, March 20, Russian TV accompanied a (pro-)Russian fighter walked over the bridge, not only showing, Ukrainian forces had abandoned their side of the river and there were no defenders left, but also making it possible to geolocate the exact cut of the bridge which is not – as claimed by the Ukrainian side – over the water, but well into the Ukrainian-controlled side of the river and thus not stopping a technically advanced enemy force at all. Final conclusions on the situation could be drawn today, when Ukraine’s Channel 5 sent a camera team to the region, proving that the incredible had happened. 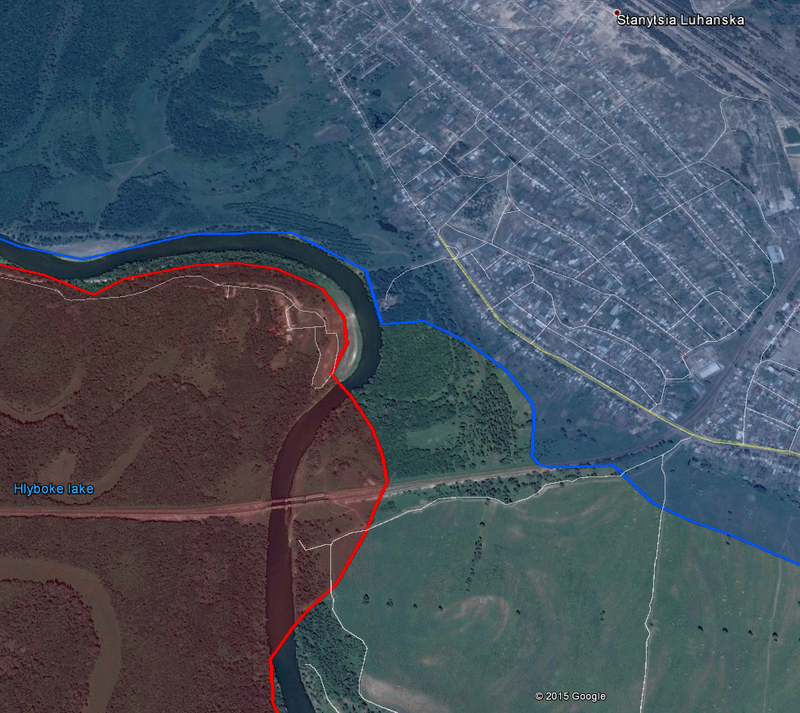 The Ukrainian army completely withdrew from near the river bridge south of the town and “Luhansk People’s Republic” / Russian forces had established yet another bridgehead on the northern bank of the river,now controlling two of the four bridges, connecting occupied Luhansk with the still-free part in the area. 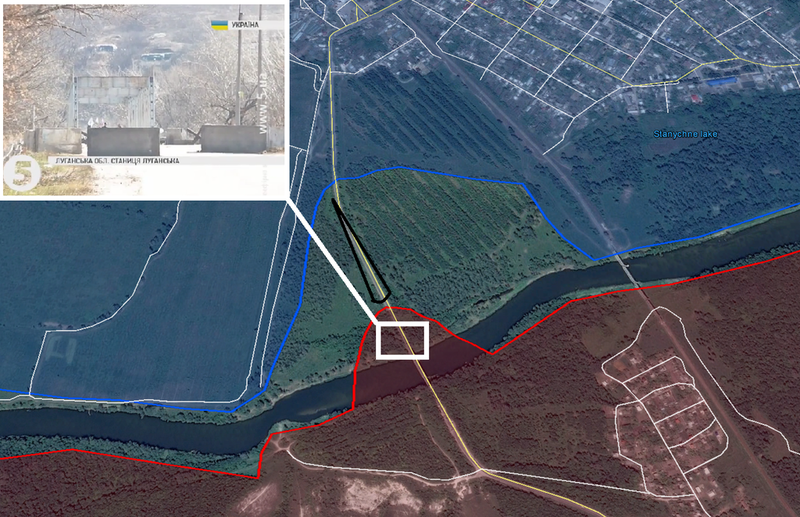 Further geolocated Ukrainian TV footage showed that badly equipped and low-numbering Ukrainian forces withdrew some 1100 meters from the newly established Russian bridgehead, just as witnessed at the western railway bridge crossing. Summarizing the strategic situation in the area reveals a gloomy outlook. There are now two Russian bridgeheads on the northern / eastern / Ukrainian side of the river, which saved the Ukrainian military of being overrun since more than 7 months. For no understandable reason, the Ukrainian military and political leadership decided to give up its largest strategic advance on the front, allowing the already superior invasion army to build springboards to Stanytsia Luhanska and thus nearby Shchaystya as well as Novoaidar little more north. While the southern bridgehead can be used to bring in infantry troops (at least until the car bridge is repaired), the western occupied railway bridge can be used to send heavy weapons like tanks over the river. Beside those obvious advantages, the Ukrainian side also bargained away the possibility to monitor the river itself, checking for pontoon bridges to be established by Russian army sappers (as seen before). The losses themselves and no military attempts to regain the two lost positions must be called absolutely irresponsible from a military as well as political point of view. Beside the dramatic change of the military initial situation on the ground, it remains once again a riddle, if the Ukrainian political and military leadership is deliberately suicidal and actively trying to put more of its soil under Russian control or completely incompetent, making exactly those tactical errors (again and again) that worsen its situation in the gravest possible direction. Last but not least, today’s footage by Ukrainian Channel 5 again showed the uselessness of the current OSCE mission to Eastern Ukraine. 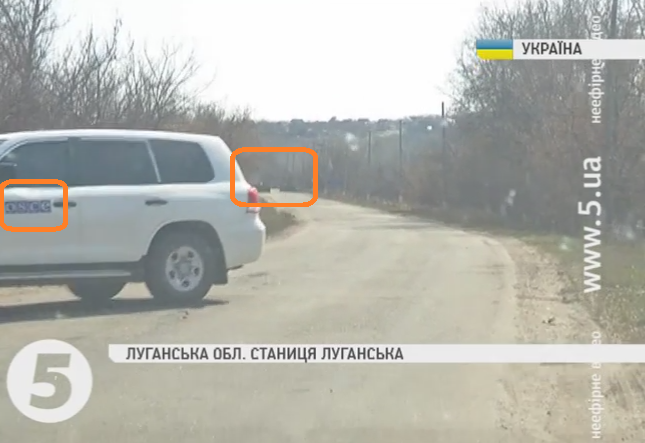 The TV team approached the newly established Russian ( “LNR”) checkpoint, which was obviously on the wrong side of the Minsk 2 – fixed demarcation line, together with at least one OSCE monitors jeep. When the OSCE monitors saw what happened from their car (from almost 500 meters away), they decided to turn around and not check for further details or – how odd would this be?! – ask the Russian forces to stick to the Minsk 2 ceasefire and demarcation line agreement and return to their side of the river. In the end, nobody seems to be really unhappy with the very recent Russian advances over the Seversky Donets and thus over the agreed on Minsk 2 demarcation line. Not the Russian side, not the Ukrainian side and not the neutral monitors. … Which is bound to end in disaster.